Mushrooms are a healthy food because they are low in calories and fat, and rich in minerals, vitamins and fiber. Mushrooms count toward the recommended intake of 200 grams of vegetables every day. Mushroom’s high nutritional value per calorie is unique. Mushrooms contain various nutrients that do not, or rarely, occur in other vegetables. 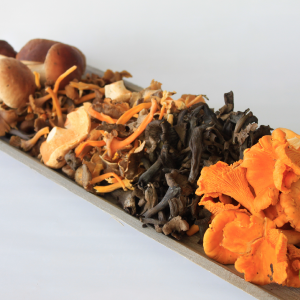 Mushrooms provide many different B Vitamins, such as vitamin B2, B3 and B5. They are crucial for energy metabolism, and in addition, B2 benefits a healthy skin and nervous system. Vitamin D2 occurs in mushrooms that grow in the wild and are exposed to sunlight. Mushrooms are a good source of protein, which contributes to the building and development of bones. Mushrooms contain a lot of fiber. Fiber contributes to the digestive process, and helps balance blood glucose. Mushrooms are low in sodium and contain lots of potassium and copper.